Although the 1992 Atlantic hurricane season was below average, Hurricane Andrew was the exception to that. 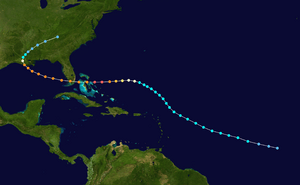 This hurricane blasted the Bahamas, southeast Florida and south central Louisiana, taking a path extremely similar to Hurricane Betsy, which also struck southern Florida and Louisiana. However, unlike Betsy, Andrew did not make flooding in New Orleans. 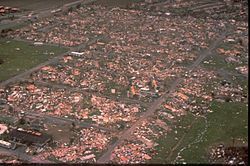 Contrary to typical, damage from Hurricane Andrew was caused almost entirely by high winds rather than storm surge in Florida and Louisiana. 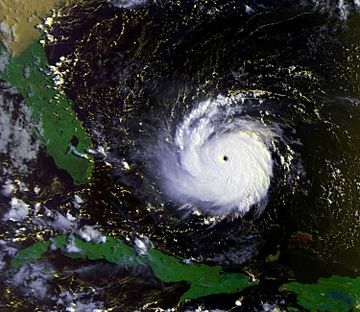 This storm caused between $23 billion and $37 billion in damage (1992 USD) and between 56 and 68 fatalities, making Andrew the costliest Atlantic hurricane to hit the United States. However, Hurricane Katrina would later surpass Andrew in official damage amounts. An entire Miami neighborhood is leveled. Andrew's devastating damage spawned many rumors. These included claims that hundreds or even thousands of migrant farm workers in south Dade County (now Miami-Dade County) were killed and their deaths were not reported in official accounts. An investigation by the Miami Herald found no basis for such rumors. These rumors were probably based on the 1928 Okeechobee Hurricane, when the deaths of migrant workers initially went uncounted, and were still debated at the time of Andrew. The slow response of federal aid to storm victims in southern Florida led Dade County emergency management director Kate Hale to become famous. At a nationally televised news conference, she exclaimed: "Where in the hell is the cavalry on this one? They keep saying we're going to get supplies. For God's sake, where are they?" Almost immediately, President George H. W. Bush promised, "Help is on the way," and mobile kitchens and tents, along with units from the 82nd Airborne Division, began pouring in. Insurance claims in the wake of the extreme damage caused by Andrew led to the bankruptcy and closure of 11 insurance agencies and drained an excessive amount of equity from 30 more. Nearly one million residences were no longer eligible for coverage by any insurance agency. This led the Florida Legislature to create new agencies (the Joint Underwriting Association, the Florida Windstorm Underwriting Association and the Florida Hurricane Catastrophe Fund) to restore important insurance coverage. Homeowners and officials criticized developers and contractors for poor building practices and poor building codes. An inquiry after the storm concluded that there were probably construction flaws in some buildings, and that the state of Florida did enforce some strict building codes since 1986, but they were either overlooked or ignored. However, the evidence was not sufficient enough to issue criminal charges for neglect. The effects of Hurricane Andrew on Florida wetlands were considerable. In the Florida Everglades, 25%, 70,000 acres (280 km²) of trees were knocked down by the storm. It took 20 days for new trees and vegetation to grow following the storms passing. Damage to marine life was moderate as the storm lowered the oxygen level in the water, threatening many fish and other marine wildlife. In addition, the storm killed 182 million fish in the basin, causing $160 million (1992 USD) in lost value. In the decade after the storm, Hurricane Andrew may have contributed to the massive and sudden housing boom in Broward County, Florida. Located just north of Miami-Dade County, residents who had lost their homes moved to western sections of the county that were just starting to be developed. The result was record growth in places like Miramar, Pembroke Pines and Weston. In Louisiana, the hurricane knocked down 80% of the trees in part of the Atchafalaya River Basin near the coast. Offshore, the storm killed 9.4 million fish, causing $7.8 million (1992 USD) in lost value, and damaged large areas of marshland along the Louisiana coast. About 6,200 people had to be housed in 36 shelters, according to the American Red Cross. The Salvation Army sent in 37 mobile food storages, that served 40,000 meals, to help those who could get little or no food. Federal aid, from the Pentagon, sent in four 750 kilowatt generators, 2,500 cots, and 30,000 MRE's, or prepackaged meals, to Louisiana. About 1,279 National Guard were deployed to Louisiana, to do various duties, from cooking to patrolling. Sheriffs along the coast of Louisiana proposed a curfew from 6 p.m. to 6 a.m. local time. Alcohol sales were also stopped immediately after the storm. 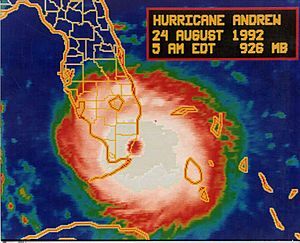 Because of exceptional and widespread damage in Florida and Louisiana, the name "Andrew" was retired in the Spring of 1993. It will never again be used for an Atlantic hurricane. The name was replaced by Alex for the 1998 season. Hurricane Andrew Facts for Kids. Kiddle Encyclopedia.